I have had my hosting plan and domain managed by SiteGround for several years now and I cannot contain my genuine appreciation for this host company. I tell everyone about SiteGround. 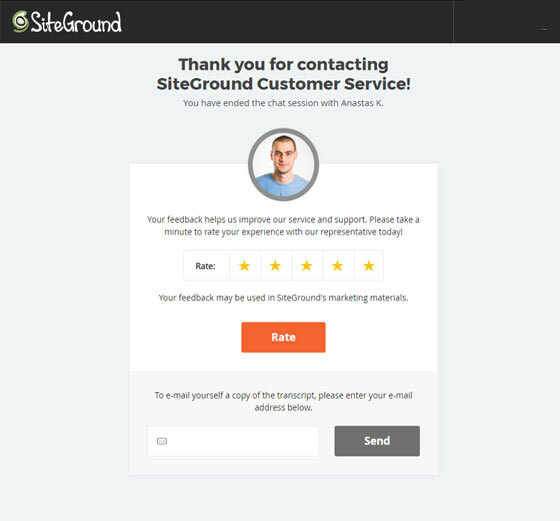 There are few key factors that make SiteGround the absolute best host provider in the market right now. If you’ve been shopping around for a host company,your search is over. I’d like to share some of the benefits of working with SiteGround. Uptime in host talk simply means the amount of uninterrupted time that your website is up and running without any server-side downtime. Hosts that offer a reliable uptime is indicative of optimal server maintenance and security. However, many hosts will have uptime guarantees. Do not simply rely on this statement. Reviews and ratings will be your best bet at getting insight on how reliable a hosts uptime actually is. Because SiteGround is awesome and they know that you’d like to move your awesome website over to their host servers they offer FREE transfers for existing websites. Their expert support team can take care of the entire process for you via chat or through their ticketing support system. While SiteGround may not be the cheapest option out there, their cost for the value is extremely advantageous. You could go with a cheaper host for lesser quality or get the most bang for your buck. SiteGround’s plans are on-par with industry standards. They also offer discount coupons occasionally, run rate specials, and offer savings for purchasing plans with a longer duration that the standard year. Notice the double-awesome? 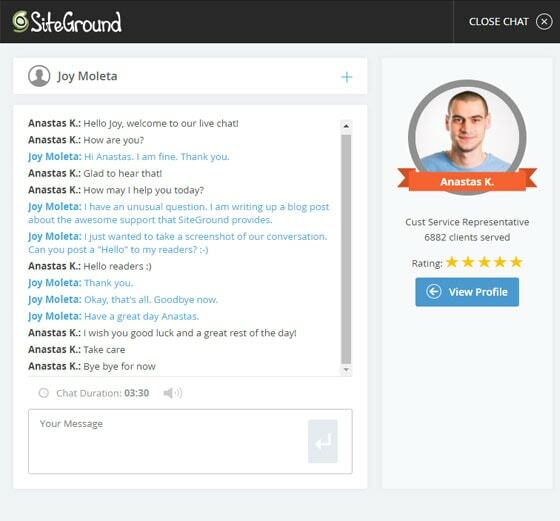 SiteGround’s support is another area that they really invest in. I’ve only used the live chat feature and their ticketing support system, but I know that phone support is also available. And they are available 24/7. Support is provided by informed agents who usually can take care of your issue right away. If they can’t, then your request is escalated to a specialist. Either way, you’re taken care of in a timely manner with accurate and polite resolutions. I’ve never waited for more than 45 seconds to connect with a chat agent. The chat sample that I’ve included below took a heart-stopping 9 seconds to get picked up. 9 seconds?! Also, take a look at how many clients Anasta has served: 6,882. I’ve chatted with agents with well over 10,000 clients served all the way down to 38, and everything in between. Sometimes you even connect with an agent who has helped you before. You can even get chat support if you are not a current customer for any presale questions you have. Go ahead, give it a try! I hope that this awesome post has given you an idea about why I love SiteGround – and why you should too. If you want to look into other opinions there are a ton of sites that offer in-depth reviews on other hosts. Some of those sites are: Web Hosting Geeks , Who is Hosting This , and Hosting Facts. With that being said. Need a host?